How important are good intercultural communication skills? Or not? How important really is good intercultural communication? It probably isn’t if you’re going to live in a bubble and only ever spend your time with people who are from the same ethnic background. In this global world we live in, how realistic is that? It might also seem simple if you’re talking about being or dealing with tourists, but what implications could it have in the boardroom or the classroom if your intercultural communication skills are a bit lacking? You’re strolling down a street in your hometown, minding your own business when BAM. Something catches your eye. ‘Oh gross. Seriously.’ *Eyeroll*. Tell me this hasn’t happened to you at least once, watching a group of people from another country or culture, while they noisily slurp their noodles, spit on the street in front of you, or do something that in your culture, you consider inappropriate public behaviour. Gross to you perhaps, but a completely acceptable part of another culture, in another country. What about in your boardroom or office space? So who’s right and does it depend on where you are? It’s all about awareness, understanding a target culture and being able to accept that different cultures have different understandings of what is and isn’t acceptable behaviour. Should we, as people in an ever shrinking global world, make a concerted effort to understand the basic cultural and social conventions of cultures we are hoping to interact with? Regardless of whose ‘home’ space we’re in? How much of an impact can it really have? Can it really change business outcomes or affect business relations? More than you might think possible. OK. I sat staring at them, wondering whether they were having me on, but they were all nodding in agreement and looking at me as if I was quite mad. All those meetings where we struggled to get opinions or ideas on any of the initiatives that were part of the project implementation, all those fruitless hours of trying to prise out what people honestly thought of what the project was hoping to achieve, finally made sense. I hung my head in my hands and laughed. Sigh. Can you imagine the difference this would have made to the project if we had had this conversation 18 months previously when we’d started working together? Whether it’s deference to elders in the Pacific, the head wobble in India, eye contact in Asia, head touching in Thailand, time management in Europe, or the myriad of other cultural idiosyncrasies, subtle differences between cultures can communicate all by themselves, wreaking havoc on business relations if left misunderstood. So the simple answer to that first question? Yes it’s important. 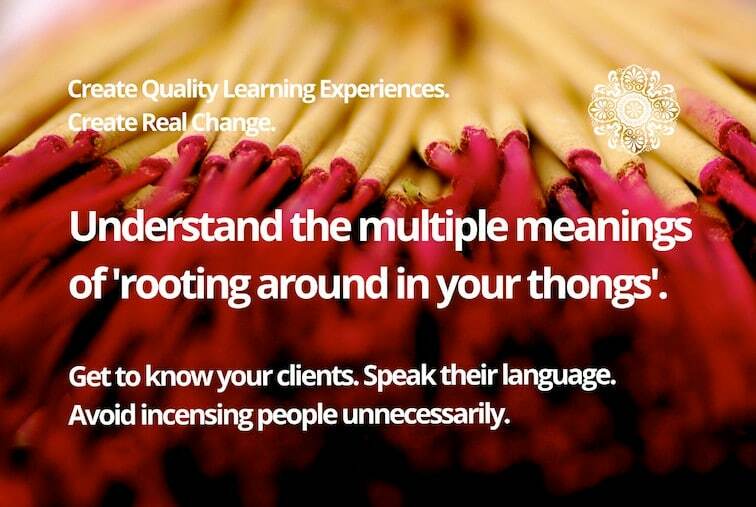 We should be making an effort to understand the cultures of the people that we’re working with and for; be that in a staffroom, classroom, boardroom or lunchroom. Think people in your workplace could do with some Intercultural Communication Skills training? Connect with me. I can help. ← Is ‘learning styles’ a myth that has finally been debunked? Great content stuck in your head & hard drives? So much to think about . . .
>> What to put in & leave out, in what order? >> How to package it? Or deliver it? Online? >> Will it just be a waste of time & money? >> Will the content actually help people and help me build my reputation as the go-to-professional in my field? Do this 3 minute quiz, and find out exactly which areas you need help with. Brilliant! Absolutely brilliant! Love your writing Maria, you are such a gifted storyteller!!! Thanks Andrea! Part of the future plans for sure! I can’t stop myself from laughing out loud and disturbing other lecturers in this open office Maria! Anyway I totally agree with you that it does not worth the time spent studying other cultures prior to implementation of programs/projects; they can be picked up and learned on the spot!